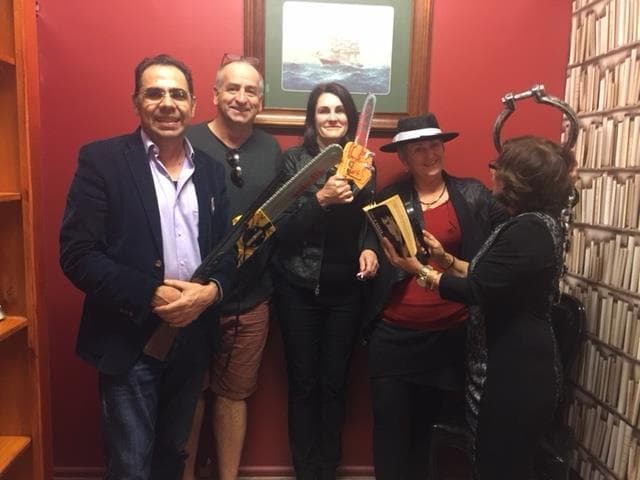 We at Madeleine Hicks Real Estate recently had a lot of fun on a team-building exercise and we’d like to offer a challenge to office teams in the 4053 postcode to have a bash at beating the time we achieved in The Library at Cube Escape Rooms. We’re passionate about community and love to support local Everton Park businesses which is why we were excited to hear about the opening of a very unusual (to us anyway) new business. It’s called Cube Escape Rooms and located at Unit 1, 514 South Pine Road, near the corner of Stafford Road just under Tim Mander’s big signboard. The idea is that you and your team go into a room and you look for clues and solve puzzles to escape within the time limit. The whole thing sounded so interesting that we rounded up all the able bodies in the office and went down there one day recently after work to see for ourselves. 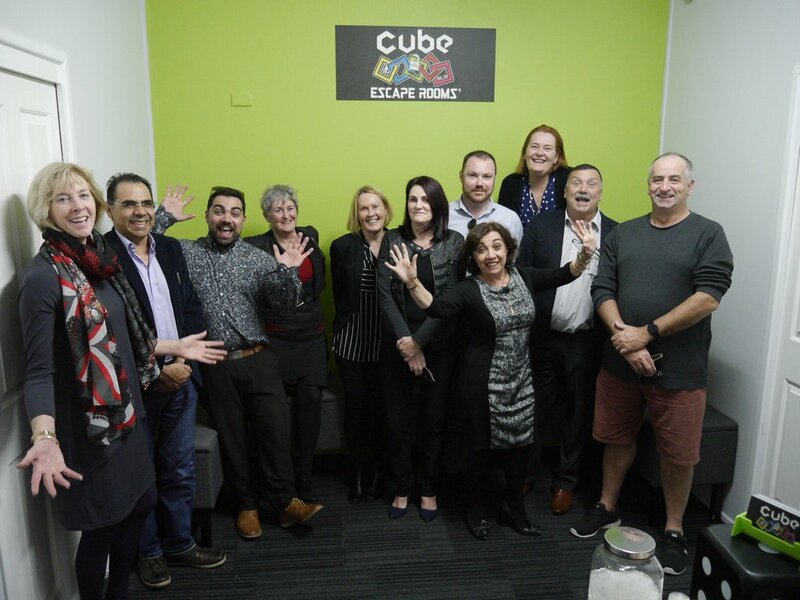 We were greeted by Cube Escape Rooms founders Jack and Angela Walklin and Lorna Dollar who explained that escape rooms are a growing form of entertainment although theirs is one of the first few to open on the northside of Brisbane. Angela puts the growing popularity of escape rooms down to the fact that it gives families, friends and work teams an opportunity to bond in the real world while tackling fiendish puzzles in an entertaining and safe environment. She said that they had had the idea to open their own escape rooms business after enjoying the experience at a number of other venues. The three fitted out the space themselves including the carpeting, interior walls, decoration and the fiendish puzzles designed by Lorna. When booking a session (at http://cubeescaperooms.com.au/) you can choose from two different rooms including Area 25, an abandoned army base. The snag is that there is a bomb rigged to explode and you have to escape before the deadline. The Library is a more difficult room to escape from and there is a sense of urgency because there is something very sinister going on. You and your team are going to have to examine every clue and solve all the puzzles to escape in time and save your lives. We divided ourselves into two teams and went into our designated rooms armed only with our wits, such as they are, timers and walkie talkies to get hints from the Cube Escape Rooms staff if necessary. We won’t spoil things but will say that you have to examine all the clues carefully and that things you find may be useful later. The less said about our Area 25 team, who are presumably still locked in there or splattered across the landscape, the better but those in The Library called on all their brainpower and resourcefulness to escape in an hour and five minutes. Afterwards, Justin Hicks said he’d enjoyed the experience very much and thought it was a great way to take a break and socialise with colleagues away from work. He said that Madeleine Hicks Real Estate challenged other Everton Park businesses to give The Library a try and beat our time.